App alerts have proven to be one of the most effective tools for maintaining engagement for media and brand developers in the app ecosystem. But they only work when the consumer has opted in to getting these pop-ups on their home screen. One of the pioneers and most popular suppliers of app alerts, Urban Airship, today introduces in-app messaging that helps a publisher push rich media and other types of messages to the surface of their apps when a customer loads them. “You may have a message, but it’s not always worth lighting up someone’s home screen and interrupting their workday to tell them something,” says Brent Hieggelke, Urban Airship CMO. “It is the capability to send rich media directly into the app.” Apps can have an internal Message Center that lets a user know there are new announcements, assets, etc. Hieggelke says they already tested the capability with the London Olympics last summer and the movie release "ParaNorman." They are also working with the video rental brand Redbox. In early tests with the London Olympics, they got response rates that were ten times higher from in-app messages tied to surveys than from email messaging, he says. Publishers can combine both in-app and push messaging to keep their users engaged. 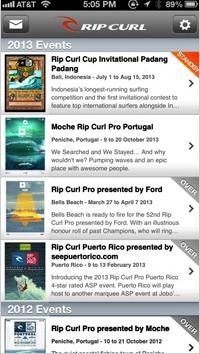 The Rip Curl Live events app, for instance, posts new images and clips in the app itself in the message center for anyone loading the app, but it also sends select push alerts to make them aware of new additions. Urban Airship hosts the content, even though it is integrated into the app itself. “A message center is easy for the marketer who is trying to drive a message into the app without having to go to the development team,” he says. It also can be a repository for recently added coupons and offers. Hieggelke says that over time publishers can establish a habit with users to check the message center for the latest material. It can also become a two-way channel, since the publisher can connect the alert to any form or survey that invites feedback. The new capability is now part of the self-serve dashboard for Urban Airship clients, including responsive design templates for composing rich media messages, a per-message reporting mechanism and the platform’s existing set of message targeting tools based on location, user preferences, etc. I always felt that app alerts were among the strongest developments on these mobile platforms for publishers. This mimics SMS without being as intrusive, and it creates at least the beginning of the dialogue between the app and the user. But it seems to me that alerts really should be invitations to two-way communications. There is still that annoying tendency for publishers to treat mobile as yet another broadcast platform. I would like to see apps use their messaging capabilities to establish channels of communication with the user. Apps should reflect the ethos of the device and person-to-person contact, not embody the broadcasting model of media from the last century. 2 comments about "Keep The Customer Notified: Urban Airship Adds In-App Messages". Robi Ganguly from Apptentive, July 10, 2013 at 11:44 a.m.
"I would like to see apps use their messaging capabilities to establish channels of communication with the user. Apps should reflect the ethos of the device and person-to-person contact, not embody the broadcasting model of media from the last century." Steve, I couldn't agree more, this is spot on. The broadcast model continues to dominate the space, but we're seeing massive amounts of engagement driven by true conversation tools. From the outset, my company, Apptentive (www.apptentive.com) has been maniacally focused on the conversations we can enable between app publishers and their customers. It's a wonderful upgrade to the customer experience and the publishers who are customer obsessed get to really highlight how much more they care about the customer. Greg Martin from Martian Technology, LLC, July 11, 2013 at 3:32 p.m.
"In early tests with the London Olympics, they got response rates that were ten times higher from in-app messages tied to surveys than from email messaging, he says." We're seeing something similar. We've used PushSpring (www.pushspring.com) to send out targeted surveys to our users via push notifications and gotten almost 3x the response rate to our email surveys. Push notifications are definitely a marketing channel everyone with an app should be exploring.